Celebrity Big Brother Spoilers roundup.. The mooch quit the game. Kandi tossed on the block up in his place. 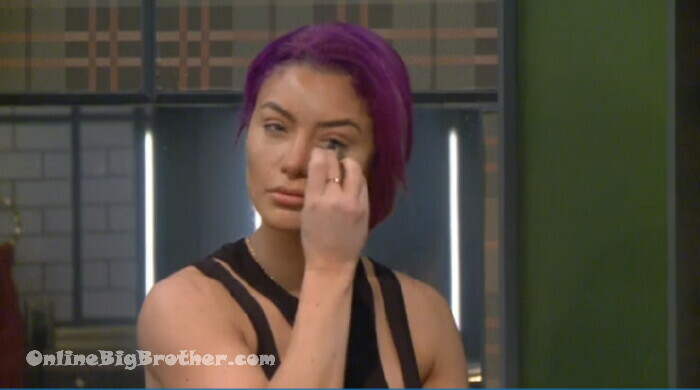 Mooch left because he had to go to Davos..
8:03am Lights on morning makeup routine..
Jon tells him he thinks the girls wan Joey nominated. He’s felt it for the last couple hours. 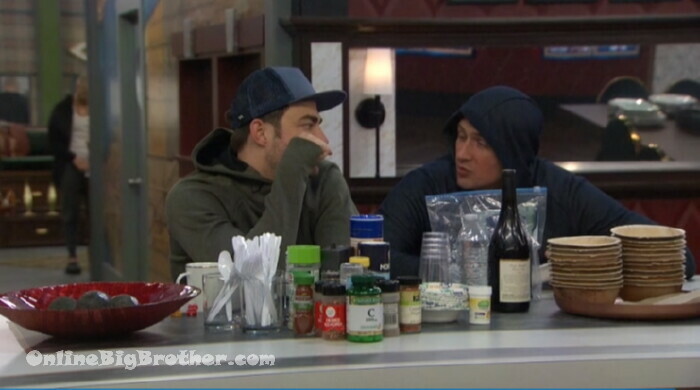 Jon says if Ryan nominates Joey it proves that they are not in an alliance. They agree to talk to the girls today and see what they have to say. and then explain this to Joey. 9:05am Ryan heads to the bedroom to talk to Tamar and eva. 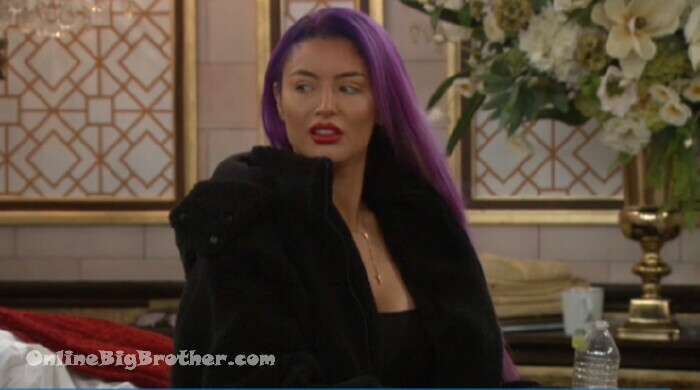 Ryan – if I have to put someone up we don’t know who..
Tamar – it better not be me ..
JOn – we want someone that will get one vote because one vote will take it from me..
JOn – Dina will not vote for me..
Tamar – IO thin kit’s the same vote either person..
Jon – if we put Joey up there’s a possibility one of the boy Kato or tom could vote for him maybe..
Jon – I want the person that is up to split the votes the way we want like in an election when there’s a independent running and then the democrat loses because …. After Jon and Ryan leave Natalie asks Tamar why all of a sudden the guys want to work with them. They’re trying to figure out when the Veto ceremony is..
Kato – I just grew up with my brother in a bunk bed and I felt the same way with Tom..
Tom – we gotta count the votes.. see who voted .. we do the math..
Tom – I’ve connect with Natalie, LOLO..
LOLO – just the nominations tonight right..
Ricky just the veto.. pretty predictable.. They agree the veto will be used but it’s unknown who will go up. Ryan doesn’t think they will have 3 nominees it will only be two. Ryan – who knows.. we had no idea Anthony was gonna..
Ryan – if Kato uses it which he is .. that they leave it at that.,. LOLO screams that she needs a massage therapist.. These two are all about the game.. planning final 4 final 2 .. They finally agree they should slow down and not “pollute” their minds. There’s a lot that could happen. Tom is skeptical about LOLO and Natalie. he thinks they are playing it cool but maybe too cool. Tom suggests they create some “pseudo alliances” with people ion their side but not their side..
Tom brings up the object of the game is to take out the strongest and least loyal people first. YAY Kato won the veto!!!!!!!! sorta knew was going happen! Hmmmm …….. Ricky won the VETO on the broadcast? Is It true that Scaramucci is gone already? Whoa! Joey Whoa!, calling alliances, backdooring,backstabs,votes all crap? Basically calling the BB game crap. he’s only seen 4 episodes? Whoa! The BB2 drinking game….Every time Tom Green says he has one nut, you drink. FYI…he has said it 4 times in 2 episodes. I have a feeling we’ll all be DRUNK. Soooo. I’m thoroughly confused now !!! Ricky won veto and didn’t use it. Am I missing something ? Dang. Thanks Simon. I went back and read again because I really thought I had lost my mind. Lol. AHHH he same thing happened to me.. I didn’t know anything about Ricky winning the first veto by watching the feeds. Started seeing things on twitter and thought for sure I had lost it. ..
Hopefully things get cleared up in the next episode if not they’ve really just going to irritate folks. They don’t have to go into a whole giant explanation but some clarity will go a long way. Perhaps there was a problem with the veto comp and so they felt it best to do it again although Kato wasn’t a player in the first veto. Every spoiler in this thread was wrong, except maybe Mooch leaving as that wasn’t shown yet. Nope… you gotta watch the feeds. Just saw your replies to the others, thanks. I guess after the mooch left they decided to hold another veto comp? I don’t think that’s ever been done. I remember them re-running a comp (in BBOTT maybe?) because of a problem with lasers or mirrors for one competitor. LOL! Mooch’s BB stay was even shorter than his WH gig. WTF? What a loser… probably gave up because he didn’t really want to face the embarrassment of being the first one out. I hope CBS took back his pay. It’s always nice to watch the show and talk about it with you guys on here, but I’m not feeling this season yet. Last year I was hooked from day 1: a bunch of “celebrities” that really knew the game and WANTED to play it. This time it’s just a bunch of hasbeens – just like last season – totally okay with the idea of just getting a check to appear on the show. Boring! Maybe some business thing came up and his plans had to change.. maybe he just wanted to be part of the pre show promotional press to keep his name in the news. Or maybe he’s just the mooch.. It was unplanned. They never mentioned any ‘twist’ like this. Plus it wouldn’t have worked if he wasn’t on the block. They had to do a second Veto comp because he left the show and that changed the number of nominees to 2, and they probably wanted to keep it at 3. He might have been debating about attending that conference, but most likely he has people who could do that for him. And people said he left his stuff in the house. Mooch definitely quit, even though BB tried to cover it up with the ‘twist’ of having a second Veto comp. What good would that twist have been if he wasn’t even on the block? They wanted to keep their 3 nominees. 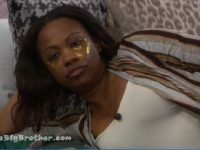 And that veto comp was so basic, just looking at a bunch of pictures and then running off stage to lock in your count? He was looking pretty haggard the last few times they showed him on screen. He probably couldn’t take being in the house, and on the block, anymore.